"Although I sometimes feel guilty that fate called Meredith home early when it just as easily could have been me, I have found peace and purpose in attempting to keep her memory alive and her passion ablaze. This summer I am thru-hiking the Appalachian Trail for myself, for Cheryl, for Irene, and especially for Meredith. I am thru-hiking as a statement to any human predators who disturb the serenity, peace, and safety of the woods. Such men cannot stifle my love of nature and solitude; they can only make me appreciate it more." Jim and I were on our Southwest trip in early January when 24-year-old Meredith Emerson was murdered by a drifter while she was out on a day hike on the Appalachian Trail in northern Georgia with her black Lab, but we heard about her disappearance and the subsequent discovery of her decapitated body 'way out there in Phoenix Police found the suspect within a few days and he confessed to her murder, the diabolical end result of a frustrated robbery attempt. You can read about it here and on other web sites. The story really got my attention as I heard more about it on the internet ultra list, in news stories, and in the AT Journeys publication. Other murders and abductions on the Trail have made me wary, but this one hit closer to home. I used to do long runs and hikes on that section of the AT on Blood Mountain when I lived in the Atlanta area in the 1970s-1990s. Sometimes I ran with one or more of my friends, but more often I was out there alone with just one of my "ultra Labs." I felt safer running with Callie, Bubba, or Tater (that was before Cody) but obviously having a big dog with her didn't save Meredith's life. 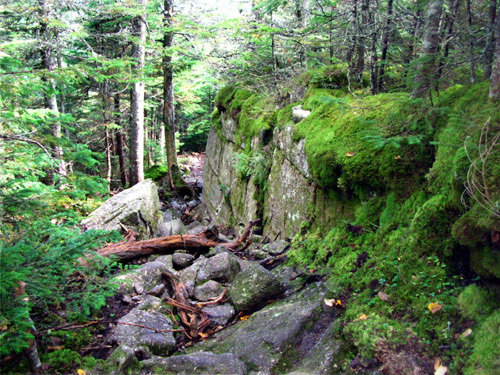 I was concerned enough before my AT Adventure Run in 2005 to read all I could about safety on the Trail, write back and forth to some women who had thru-hiked it, and take a self-defense course from the police department, but I wasn't too paranoid about running and hiking from Georgia to Maine. I so badly wanted to complete this quest -- and there weren't any recent murders to scare me off.. I'm so glad I went ahead with that journey run. There were only a couple times I was uncomfortable around anyone for 2,175 miles, and I moved along quickly in those instances with no harm done. I figured the stronger and faster I looked, the less likely anyone would want to mess with me. It's very sad that any hikers, male or female, have to be so careful nowadays when they should be able to simply enjoy their freedom in the great outdoors. I'd probably feel differently about running or hiking through that area now. Because of my deteriorating knees, it's unlikely I'll ever run over Blood Mountain again. That's too bad because I'd like to bravely hike there in Meredith's memory, just as Jennifer Pharr is hiking the entire AT in honor of Meredith and other women who have been murdered while enjoying being out in the wilderness. 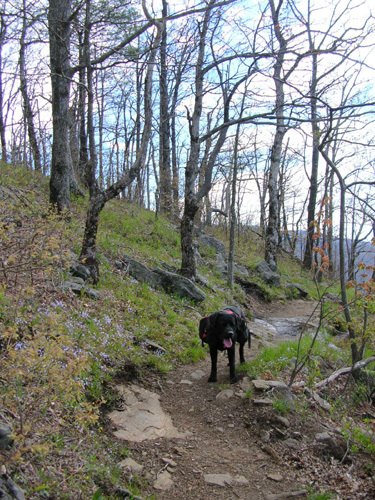 The first I heard about Jennifer's speed hike was in the March, 2008 issue of Blue Ridge Outdoors magazine. This excellent essay she wrote explains her reaction to those deaths and why she feels compelled to do another AT trek in their honor (her first one was in 2005, but I don't remember seeing her on the Trail). More about Jennifer's newest adventure in a moment . . . Since Jim and I don't have beautiful Rocky Mountain photos to show you again this summer, or tales from those trails and races to share, we'll give you some links where you can follow several endurance runners and hikers as they attempt transcontinental journey runs or try to set new Appalachian Trail records this summer. 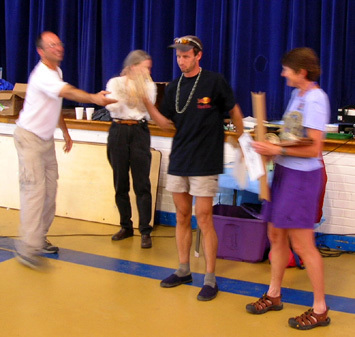 We got lots of positive feedback during our AT Adventure Run in 2005 from folks who enjoyed our trek vicariously. People wrote that they eagerly read each new entry at breakfast or during a break at work, checking in to see how far we'd gone, look at new photos, and hear our tales from the trail. I've done the same with other people's accounts of their journey runs or hikes, and I know how addictive they can be! Right now I'm checking in daily to see how Jennifer is doing on the AT, although her blog posts are several days apart. She is running/hiking the Trail much as I did, with her husband crewing for her, so she has more access to a computer than a backpacker. Most of the adventurers mentioned below are out on the roads or trails right now. Karl Meltzer won't begin his AT run until August but you can check out his web site now and bookmark it for later. I don't believe any of the runners are posting daily updates to their web sites like I did (silly me! ), but I haven't scanned all the current journey run links on John Wallace's site yet. More about his transcontinental journey run site later. 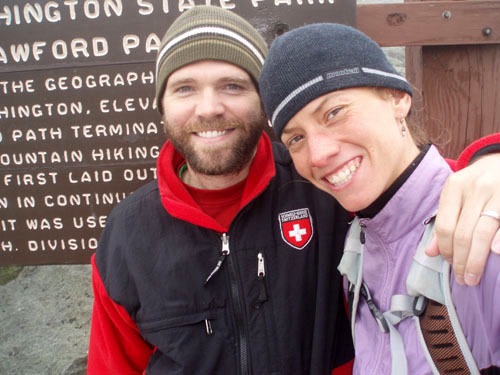 Two ultra runners have announced their intentions to attempt new women's and men's speed records on the Appalachian Trail this summer: Jennifer Pharr and Karl Meltzer. 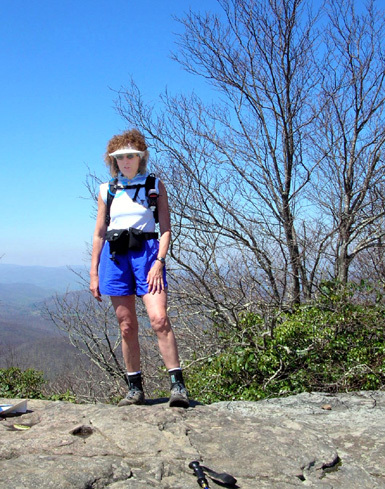 Photo of Jennifer Pharr from the Blue Ridge Outdoors web site. At the end of May I sent Jen a quick note about my trek, with a link to our web site, and wished her well. Unfortunately, it was just a few days before her trip from North Carolina to New England for her wedding to Brew Davis, their honeymoon, and the beginning of her hike -- that's a lot happening in nine or ten days! Thank you so much for your note and journal. I have been spending much too much time reading it tonight instead of working on the wedding or hike planning like I am supposed to be doing. It is great to hear about your adventure, and I look forward to having you travel along with Brew and I via the internet. Please let us know if you have any suggestions or advice for the upcoming hike. Brew and I certainly are curious about how the dynamic of "man and wife" will play into the adventure. I know I have heard your name either from David Horton or Warren Doyle and it is great to finally personally correspond. Thank you for being a pioneer for a passion that I will pursue this summer. We had time for only one or two more letters, and she was gone. Jen is attempting to hike the AT southbound (SOBO) in 60 to 80 days, which is certainly manageable for this young, fit, and experienced long-trail hiker. Barely 25, she has hiked over 6,000 miles on National Scenic Trails since 2005 and has trekked on six continents. She did a northbound (NOBO) thru-hike of the AT in 2005, so she has considerable "course familiarity" that will help her during this attempt. 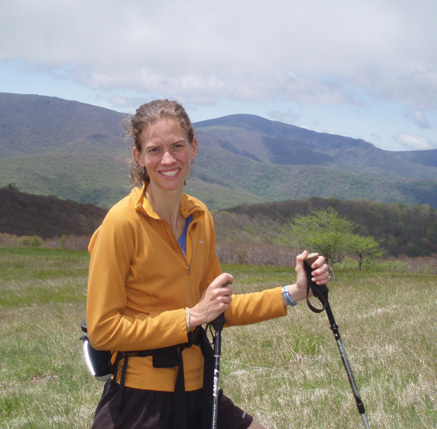 She has also thru-hiked the Pacific Crest Trail and has the unsupported Long Trail (VT) women's record. Apparently the fastest unsupported women's hike of the AT is 89 days (Jenny Jardine). I don't know what the record is for a supported hike and Jennifer doesn't mention it anywhere that I've seen. (I wasn't able to find that information before my run/hike either). Jen's hike is supported by her new husband, Brew, who plans to meet her at times during the day and carry in supplies so they can camp on the Trail most nights (some nights will be in motels or homes). Jen will be covering some long distances and I'm guessing she'll have to do some running to get the miles done before dark. She isn't carrying a full backpack. Brew Davis and Jen, from the BRO web site. Her blog is on the Blue Rridge Outdoors (BRO) web site. It's interesting but I'm left wanting more! There is no itinerary posted or even dates on the entries, other than the month. It's impossible to follow her journey on an AT map this way. I'd really like to see what her beginning and end points are for each day. Maybe she plans to post that after the hike. I shouldn't complain, though. Although I was quite specific in my own journal about the trail heads and distances (and a lot of other stuff) for each day, I gave up posting an itinerary on, oh, about the second week! It was impossible for me to stick with a schedule because of all the variables. Since Jen has a 20-day window of her expected time on the Trail, it's obvious she's going with the flow, too. You have to scroll down the web page each time to get to Jen's latest report. When you click on one of the entries you'll see links at the top of the new page to leave a (public) comment or subscribe to the "Pharr Out Blog" so you can be notified of updates. I just did that today. Since she isn't writing every day, I won't have to go to the web site until I get a notice. Brew has written a couple of interesting entries, too -- something I never was able to get Jim to do during my trek! It's great to read his perspective of the adventure. The one about his "missed connections" is priceless and reminds me of the times when Jim and I had a few similar rendezvous challenges. I'm rooting for Jennifer to meet her goals on this trek, to have lots of fun, and to remain safe the entire distance. She's a great role model for younger women. Later this summer Karl will try to beat Andrew Thompson's AT record set in 2005 (47 days, 13 hours, 31 minutes). The "Speed Goat" is aiming for anything faster than that from Maine to Georgia. The itinerary on his web site shows a Day 48, so he may beat the record by only a few hours or minutes. Karl plans to begin his run at Mt. Katahdin on August 5 and will be going SOBO like Andrew did. Now age 41, Karl has the record for the most 100-mile wins in one year (six in 2006). He's fast over the course of a hundred miles, but can he manage an average of 46+ miles a day for 47 days on a rocky, sawtooth-ridged trail like the AT -- in the heat and humidity of the East in August and September? We'll see! Karl describes himself as a professional ultra runner. He's one of only a few who can make a living in this sport. Although there aren't usually any monetary prizes for winning ultras, runners like Karl often have generous sponsors and sometimes races will comp their entries, give them free lodging, and/or offer appearance money. 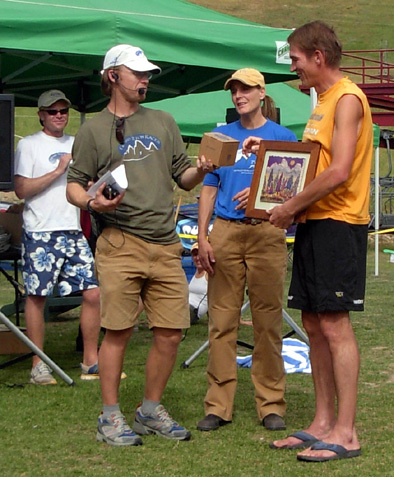 Karl offers coaching services, runs a summer running camp, and directs the Speed Goat 50K race. Like Jennifer, Karl has several sponsors for his speed attempt. The Backcountry.com web site that will be "mission control" during the run is http://whereskarl.com/. There's a video on the home page now, and a link to get updates via e-mail. I have no idea how often the site will be updated once Karl gets going, or how detailed the information will be. For many, many other long trail thru-hikers' reports, check out the fabulous Trail Journals web site. You could spend the rest of your life reading these interesting journals from the AT, PCT, CDT, Long Trail, and others. Not only is it a great vicarious read, it's good research if you ever intend to hike or run these trails (or parts of them). If you think setting a speed record on the AT is daunting, how about trying to run as fast as you can on paved roads across the breadth of the USA?? Or even just trying to run across it regardless of pace? No thanks, but I can appreciate what these folks do. A good web site for previous, current, and future transcontinental runs is produced by John Wallace, III who ran across the country in 2004 and has a keen interest in compiling the results of such runs. John has an historical list of 210 crossings by 184 individuals since 1909. Very cool. Listed on the home page are the year 2008 crossings, with four already completed and eight or nine in progress or planned to begin later this summer. You can see at a glance which direction each runner is going (most go west to east with the prevailing winds), start and end points, distance (2,630 to 3,700 miles, depending on route), cause for which they are running (many folks use these runs to raise money for charities), and the web site for each run. Some of the runs are supported by crews, some are not. 1. Glen Turner, who ran self-supported with a specially-rigged running cart to carry his supplies, has already finished his 2,630-mile run across the southern part of the US in 37+ days. He ran from Oceanside, CA to Savannah, GA and slept in his cart along the way, re-supplying as needed. We've known Glen for about ten years, mostly from the Leadville 100 race. 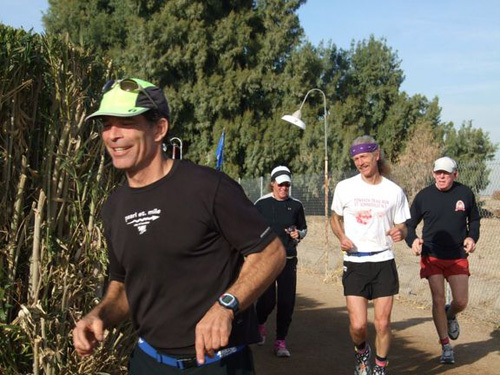 Jamil Coury took this photo of Glen during the ATY race in December -- and happened to catch Jim on the right! 2. I'm looking forward to following Marshall Ulrich and Charlie Engle's 3,200-mile trek across America from San Francisco to New York City when they begin in early August. Both are elite, well-experienced journey / adventure runners. Charlie is, among other things, a movie producer. His company, Running America, will produce a documentary of the run. They're looking for five people per mile (that's a lot of people!) to run with Charlie and Marshall along the route, which is shown on the web site. There are also links to Charlie's and Marshall's individual web sites..
3. When I talked to race director Lisa-Smith Batchen last fall at the Teton races she was planning to do a 3,200-mile transcon run from Huntington Beach, CA to New York City with Louise Cooper. That run has been postponed until 2010. Instead, this summer Lisa, an elite ultra runner and coach, will be doing a two-part run/bike trek to raise money for AIDs orphans in Africa. She calls it the "Death Valley 810." Lisa plans to run from Las Vegas (NV) to the start of the Badwater race in Death Valley (CA) beginning July 9. Then she'll run 135 miles in the official race and finish on top of Mt. Whitney -- for a total of 302 running miles with an elevation gain from 292 feet below sea level in Death Valley to 14,496 feet above sea level on top of Whitney. The second part of her journey will be the non-stop 508-mile Furnace Creek bicycle race through Death Valley in October. If you think running about 3,000 miles from one coast of the U.S. to the other is extreme, consider that some folks run across Europe, Australia, or the entire globe! At least one turned out to be a hoax a few years ago, but most of these attempts are well-enough documented and observed to be verified as real. My favorite runner in this group is 61-year-old Rosie Swale-Pope who has been running around the world self-supported the last five years. She recently returned to her home in Wales after the adventure of a lifetime. What an inspiration! 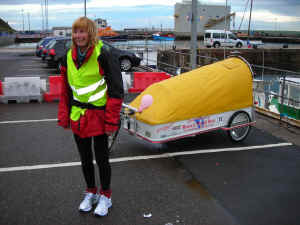 She pulled a cart that carried supplies and served as a tent for sleeping, similar to the way Glen Turner traveled across the USA. "On the 2nd of October 2003 my 57th birthday, I'm going to set off to run around the world. I shall be solo, self supporting and on a very low budget. My dearest wish anyway, is just to do a complete circle of the earth. The death of my husband Clive from prostate cancer, taught me more than anything about how precious life is; How short it can be, that you HAVE to grab life, do what you can while you can, and try to give something back. I'll be trying to raise awareness of the following very special charities . . ."
And, by golly, she was successful! Quite a few new walks added. Some updated running info. Follow along any ones that interest you! Pass along info/links to any new ones you hear about. Even though most of us aren't capable physically, financially, time-wise, or for other reasons to run, hike, or bike these mega-distances, it's fun to follow along vicariously during or after such adventures. I hope it inspires you to hatch a plan for your own adventure runs, hikes, or rides some place near your home -- or somewhere more exotic! So many possibilities, so little time . . .